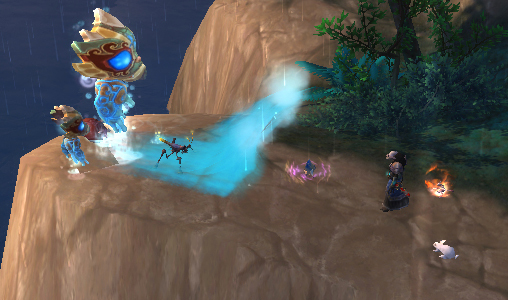 Update for 6.0: This strategy still works really well as a two-pet leveling strategy. If you’re here for an Awfully Big Adventure with your Elekk Plushie, this works perfectly well for that, too. It is about good freaking time I wrote this, but I’ve been putting it off. This Spirit Tamer uses a gimmick I’ve seen parroted a few times in PVP. It combines huge damage with stuns, but it’s relatively quite easy to counter if you know what’s coming. There are a few other ways you can go. 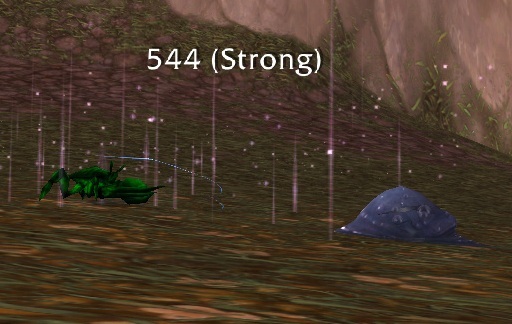 The Tamer’s first pet is aquatic, so I use my dragonbone hatchling Legree to counter. I would definitely recommend something that does a lot of Flying damage with some kind of avoidance, namely Lift-Off. A moth with Cocoon also works, but not *quite* as well. My speedy rabbit Dill is there for the dodge/burrow combo. We’ll get into why in a bit, because I use it a little bit differently here. I’d recommend keeping with a critter, because the last guy is elemental, and you definitely want at least a Burrow or Dodge or something. A Core Hound Pup might be an alright choice if you have one. I initially did this fight with my Perky Pug, so just the one avoid can work, too. 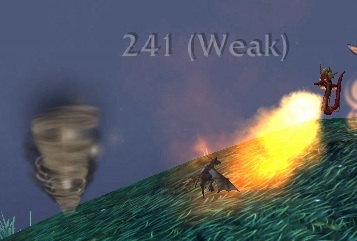 The pet to be leveled is fairly high level and not Mechanical because there is a lot of AoE flying around. The first pet is an aquatic fish named Marley. He has Dive, Whirlpool, which pops up a lot on Emperor Crabs in PVP, plus Pump, which makes all those abilities hit harder when it’s active and then gets unleashed for big damage. Whirlpool is particularly devastating in PVP, because it restricts swapping, but here it’s just a lot of damage. He’ll also pair this with Dive, so that if you don’t avoid it somehow, it’s a huge amount of damage all at once. We’ll use Liftoff the turn before it blows up to avoid it, easy peasy. I prefer a bird with Lift Off to Cocoon, because Cocoon will only avoid one hit so you’ll take lots of damage from Whirlpool or Dive (because as a flyer you’re going to be faster), but my experience is that a moth can rip through here fairly easily regardless. Next up is the critter Tiptoe. He has an AoE with Tidal Wave, a straightforward nuke, and a heal. You want to kill him ASAP because of the AoE. I just keep attacking/avoiding with my Flying pet until it dies, and then swap to my rabbit. Tiptoe doesn’t have a lot of burst damage, but if he heals a lot you’ll find yourself with a dead back row. Kill him ASAP. I use Burrow to try to get big damage, but other than that, don’t worry about defense with your main pet. You’d just be wasting the turns you have until his heal comes off cooldown. And now, Ladies and Gents, the gimmick. 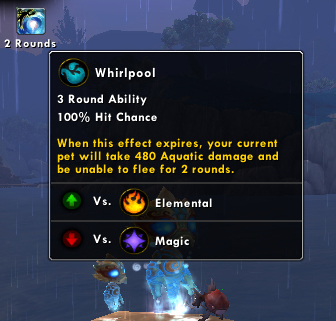 The Flowing Pandaren Spirit casts whirlpool like the fish, but pairs it with Geyser for enormous damage, at the end of a round no less. Luckily, with your rabbit, you can just use your Dodge or Burrow abilities to avoid it. 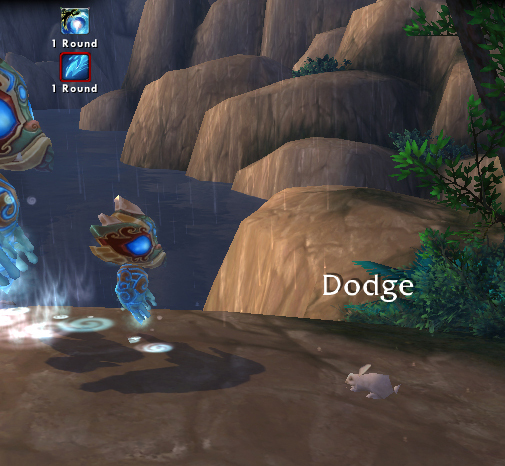 I don’t use the typical rabbit ‘pattern’, because after the first set where both Whirlpool and Geyser hits at once, the two abilities are out of sync. I use Dodge to counter one and Burrow to counter the other. 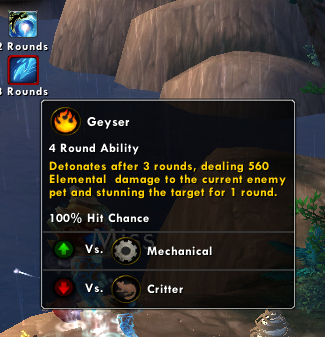 If the pet you chose is working off just one avoidance ability, avoid the geyser. You should make it past the first one no problem as they’re sort of synced up, and you’ll likely make it past the second series at the very least. I’ve been seeing the geyser/whirlpool combo in PVP a few times recently. 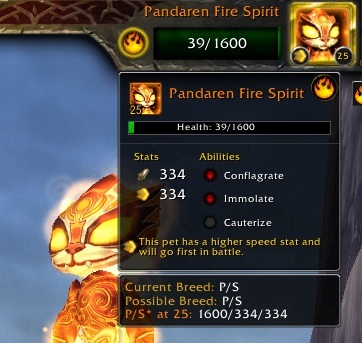 The only pet with this combo is the mini Flowing Pandaren Spirit, so if you see that coming, you know what you’re in for, but you can try using whirlpool or geyser with Dive for another decent combo. In the end, you’ll be able to beat this spirit rather handily, even if he doesn’t make for a good choice to level lowbie pets. 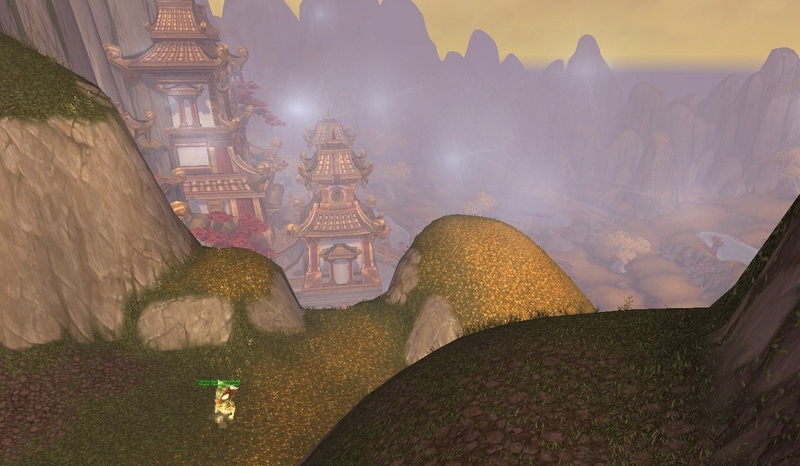 The reason I was waiting on giving him his own walkthrough is because of the central conflict of Mists of Pandaria. It makes me deeply sad to think of this Spirit Tamer, being here for time immemorial, training his pets and enjoying the natural beauty of southern Krasarang Wilds. 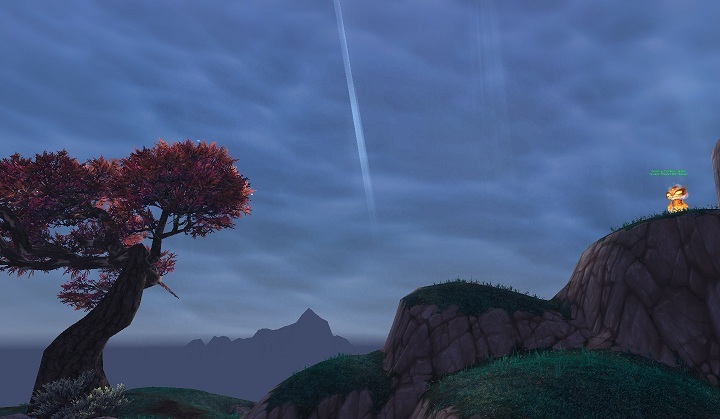 Long before Garrosh took to destroying the beauty of the Vale, he also ruined the serenity and beauty of this Tamer’s far-flung locale. We’ll get him little guy, though it’s cold comfort now. I also made a quick & dirty video of this fight if you’d like to watch for more help. This entry was posted in strategy, tamers and tagged daily, spirit tamer, strategy on July 9, 2013 by Liopleurodon. 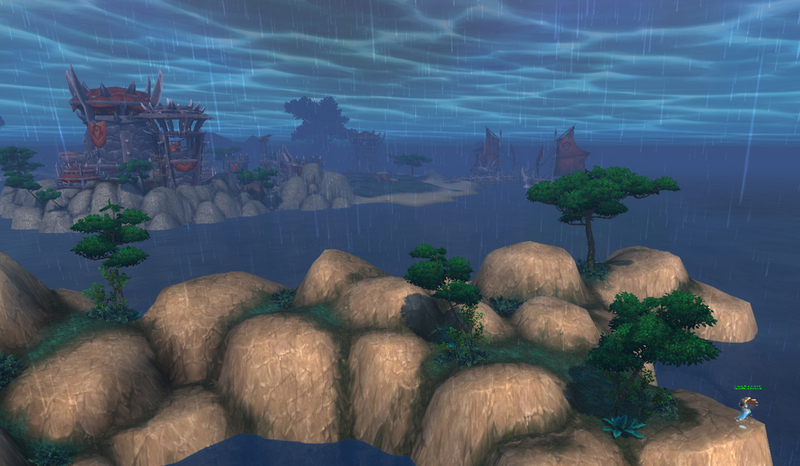 The Whispering tamer is in a very picturesque spot of Pandaria. 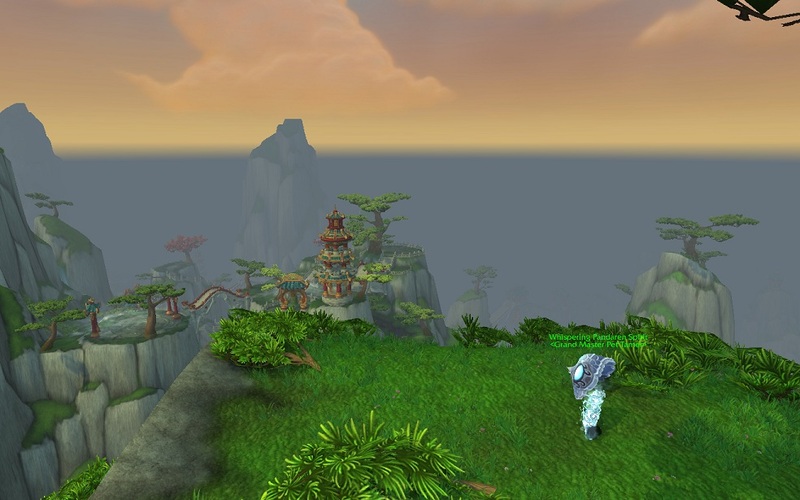 She overlooks the area shrouded in fog where Nazgrel, Windsor and Chen Stormstout fought in the Mists of Pandaria trailer, and it’s just breathtaking, even if it does make her hard to find. All those stupid pillars in the Jade Forest look exactly the same to me. I usually look for the fog because it has an absurdly long draw distance, and then look immediately west, and there she is. Oh, hi there. I’m here to hopefully make you cry real tears. But if you can’t, since you’re made of wind and all, maybe you could like, pretend for my benefit. That would be fantastic. One pet to be leveled, and 2 dragons. Funny story. All the attacks of all her pets are Flying. Every last one. Seriously. So as long as you pick a couple dragons, you win. 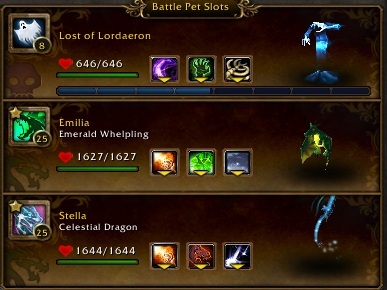 My Emerald Whelpling Emilia is a really good choice as a tank, with her Emerald Presence shield ability, and her heal Tranquility, which I as a druid especially enjoy. It’s a very similar setup to my crab. Stella the Celestial Dragon also has a lot of staying power with a self heal, and a unique combo group heal/group nuke on a long timer. The celestial dragon may not be available to a newer collector, but don’t worry. Almost any team of 2 dragons will work. I’d definitely consider switching her out for someone with a bit more firepower like a Spawn of Onyxia. This particular setup is a sure thing, but takes a while to win. There are no backrow abilities either, but for these tamers I like to start a bit higher, because that first attack almost kills them even at level 8. Regardless, this is a relatively easy fight and a great place to start your spirit taming journey. Even though I’m writing this walkthrough third. Whatever. The leadoff pet is Dusty, a moth which is somehow a critter. 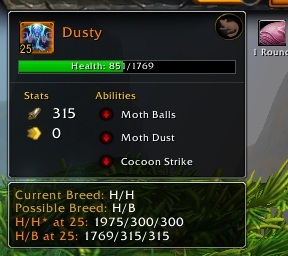 (NOTE – After 5.4, Dusty is now properly a Flying battle pet, not a critter. However, the strategy as follows is still otherwise accurate). If you do opt to use an Onyxian Whelpling or some other dragon with a big nuke on a timer, be mindful of the timer on Cocoon Strike, which can absorb that nuke. Otherwise, meh. The second pet is Whispertail the dragon. Whispertail has 3 abilities. Guess what they are. weak, weak and weak. He does have an armor shatter ability, but it just makes his damage go from yawn to yawners. Meh. He doesn’t have any dodges or blocks like Dusty, so just beat him down until he’s on the floor. It’s kind of weird. Neither Whispertail nor Dusty have an analogous pet a player is able to have, as far as I know. Dusty closely mirrors the abilities of all moths, but is a critter. Not that either would be a huge asset to our stables, I’m just saying. It’s odd compared to what we’ve seen before. The difference here is that the Air Spirit also has a rather annoying heal, which is why she only rates 2 out of 3 weaks. I switch to Emilia (even if Stella hasn’t gone to the Great Gold Hoard In The Sky) and make sure to use her Emerald Presence ability, because all the Spirit’s attacks are bundles of smaller attacks. I only use Tranquility when I get below 800 HP or so because otherwise I’ll spend every 3rd turn refreshing it, and dude I have other things to do today. 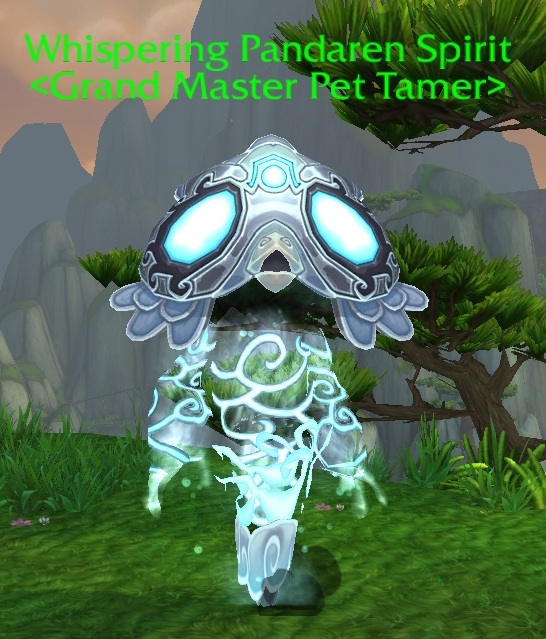 The Whispering Spirit Tamer’s proximity as the crow flies (druid pun) to the Vale and Black Market Auction House make her a good target to hit while you go about your day. I find beating her quite relaxing before going off and killing orcs or biting virmen in the face. Because after all, look at that view. If you’re here to go on an Awfully Big Adventure with your Elekk Plushie, this strategy is completely valid. Just swap in your Plushie where you would your carry pet. The video below shows a carry using my Elekk Plushie. This entry was posted in strategy, tamers and tagged daily, elekk carry, spirit tamer, strategy on April 11, 2013 by Liopleurodon. For many tamers, this is the hardest fight in the game right now. The most bandied around piece of advice I’ve heard thus far with the Thundering tamer is to make super extra sure you grab the mini Thundering when you finish that first quest, because hoo boy, you do NOT want to even try to do THAT one again. Well, I have to say I agree. I mean, I have this sucker down pretty well. The thing is, the nature of this particular fight can make it wildly unpredictable. 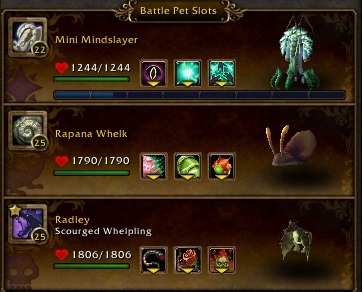 I’ve blown all 3 of my pets against the first guy before, even after I had half a clue what was going on and wasn’t just sending whatever at him to see what sticks. I’ve also had kills where I used one pet and barely even had to touch a second. My best advice here is to just keep trying. You’ll get him, I promise. 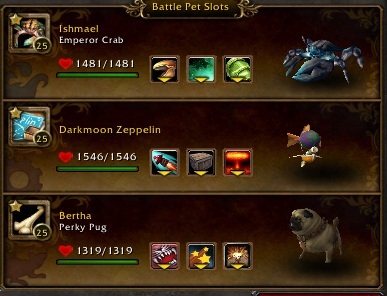 The order is a little screwed up… my pug Bertha should be first. She combines burrow and a decent heal with well, being a critter. The mechanical Zeppelin has some good defensive abilities, but most notably, Explode. The crab is there as a filler/tank. His most important role is to gap fill if I get a bad or weird string on Bertha, and to be alive at the end of the fight. For all three there are other options, but I’ll discuss them as I outline the fight. 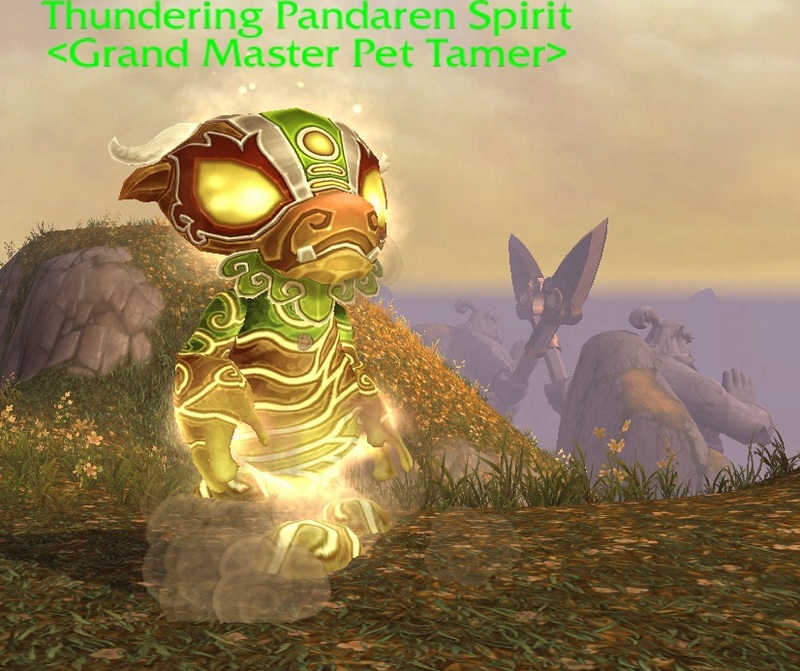 First up is the Pandaren Earth Spirit. He combines stuns with big damage. 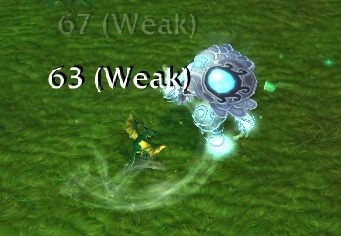 His stuns are frustrating and deadly against any other kind of pet (even with the new Resilient buff, so you can no longer be completely stunlocked) those same stuns are pretty much cute against a critter’s crowd control breaking ability. His big, fairly constant damage is problematic, but my pug Bertha uses burrow to try to avoid the larger nuke on Rupture. Since the Spirit’s damage is weak against critters anyway, I get through this part of the fight pretty easily. I like Bertha’s heal, but many tamers prefer a rabbit here for the extra speed. The critter stun breaker only kicks in at the end of the round. Since she’s slower than the elemental she ‘misses’ a round here & there because the elemental gets a stun off, and then she’s stunned the rest of the round through her turn. You really want to stick with a critter, because of the whole stunlock deal I mentioned earlier, and as shown in the screenshot above, most of the damage the spirit deals is weak against critters (the third ability being a stun with no damage). Snails are also a decent critter pick here, and hit super hard with aquatic Dive. Another reason I choose Bertha is because her main damage ability can be Beast, which makes her able to damage the second pet, critter Sludgy, pretty well. Sludgy’s damage is very streaky, due both to his moderate miss ability Expunge, and the way he uses (or doesn’t use) his other two abilities. One is the hard-hitting magic Ooze Touch, and the other is a fairly cruddy DoT spell, Creeping Ooze. It’s relatively random which one he uses, whether it hits or not, etc. Some fights I can plow straight through the whole way with Bertha, and others I get two shot. Hence the above pic illustrating Bertha hitting him hard with her beast damage where there’s a crab in place of poor little dead Bertha. This is the place where you’d swap in a pet for leveling, but keep them high level for sure. Think either beast damage, to kill critter Sludgy faster, or mechanical pets, to defend against his oddly magic attacks and use Failsafe as a swap backup if he hits you too hard. I’d also pick a pet with some defensive capability if possible. I went with the crab just to get it done, and would suggest you start off with your favorite level 25 tank in the #2 spot until you get a better feel for the fight. If it starts looking dicey and your pet is about to eat dirt, take it out. You have to have at least one pet still alive in the back row when Darnak comes out with this strategy or you’ll lose. Obviously if you’re trying to level a pet, you want that pet alive or else why even bother, right? And now use your Zeppelin’s decoy to defend and his missile which is strong against Darnak’s Beastly self to take him to just a bit below 50% and then… boom. Explode kills your Zep and the other guy, but you cannot use the mechanical Failsafe to res, hence why you must have one other pet alive in the back row. This is kind of gimmicky, but man is it fun, and it’s also kind of lazy. Lazy is kind of my jam. Make sure you use it when Darnak’s burrow is on cooldown though. Otherwise, I’ll have no choice but to laugh at your expense, sorry. 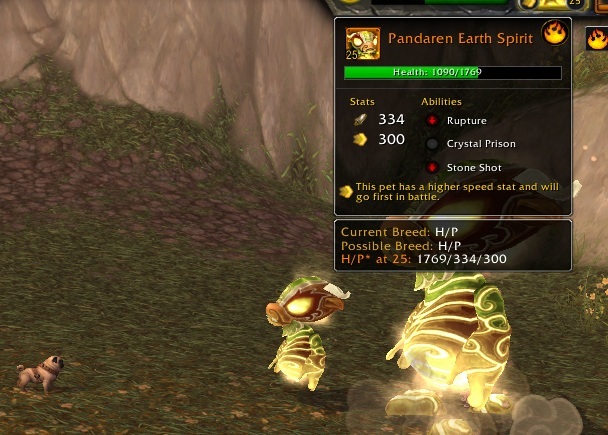 As another option, the Mechanical Pandaren Hatchling is very similar to the Zep and slightly more readily available, but needs a stone upgrade to rare. Clockwork Gnome would be a good choice here, but Darnak has a stoneskin ability which would negate his turret so using him is kind of futile. Stoneskin is also why you need to take him a bit lower than you may think if you go with Explode. 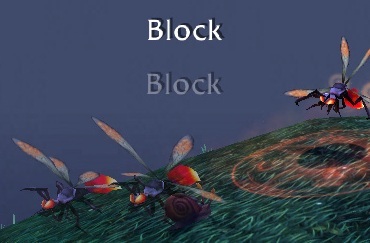 Some tamers like to use critters instead to reduce the elemental damage from stone rush. In closing… just… good luck. Please feel free to ask any questions or woodshed this fight here or on Twitter. Even if you have a solid strategy, it’s still kind of a doozy. This entry was posted in tamers and tagged auctionable, RNG, spirit tamer, strategy on March 29, 2013 by Liopleurodon. Update for 6.0: This strategy is up to date. If you’re here on your Awfully Big Adventure with your Elekk Plushie, just follow the advice given below for a normal leveling carry. Also, I did finally get my Burning pet. Thanks for asking! For now, this guy is my white whale. Oh, I can beat his face in no problem. In fact, this is a powerlevel guide, after a fashion. But I would like to have his tiny doppelganger for my own, and he simply will not drop from his bag. It’s a real love-hate thing, because he does kind of have a cute face, but good lord am I sick of seeing it. And yes, I know that I can just buy one for myself off the AH if I so choose, but now? Now, it’s the principle of the thing. 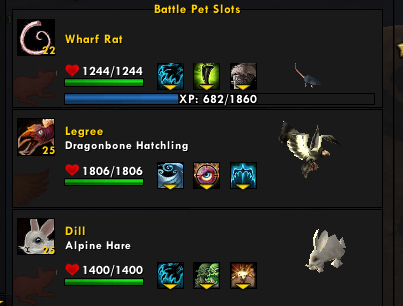 The most obvious thing here is that the pet to be leveled is rather high, at level 22. This is because the first pet out of the gate, Crimson, has the ability Cyclone, which has a chance to inflict 150+ damage to any of the pets on your team every turn for 5 turns. If this debuff isn’t present, Crimson will almost always use it, and with Liftoff for mitigation he usually gets a chance to cast it twice, so this debuff typically lasts at least 10 rounds for me. 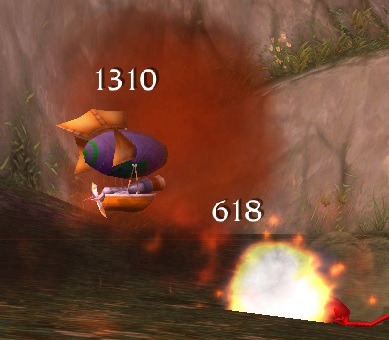 As a result, though RNG plays a factor, I don’t use any leveling pet below level 20 on this fight, and I avoid aquatics (which are vulnerable to the flying damage) altogether. Crimson’s last ability and main dps ability, Breath, is of the dragon school, which is why I choose Radley the Scourged Whelpling. He’s undead, so dragon abilities ain’t no thang. With his Plagued Blood ability, Radley usually destroys Crimson, and gets through at least part of the Burning Fire Spirit. Many people use the Rapana Whelk and other snails as their tank of choice, but I’m obviously rather attached to my crab Ishmael. This is one instance though, where the crab just will not do the job. Being aquatic, crabs are very vulnerable to that back row damage from Cyclone I talked about before. Snails are classed as critters, so they don’t have that same problem. Because the whelk is a critter, all of the Fire Spirit’s offensive abilities are weaker against him too, making him really ideal for the second leg of the fight. One thing you should try to do though, is to use your whelk’s Dive ability to avoid Conflagrate. The spirit usually casts it whenever it’s off cooldown. If you miss it you can still win, but even with the mitigation it can be a big hit. 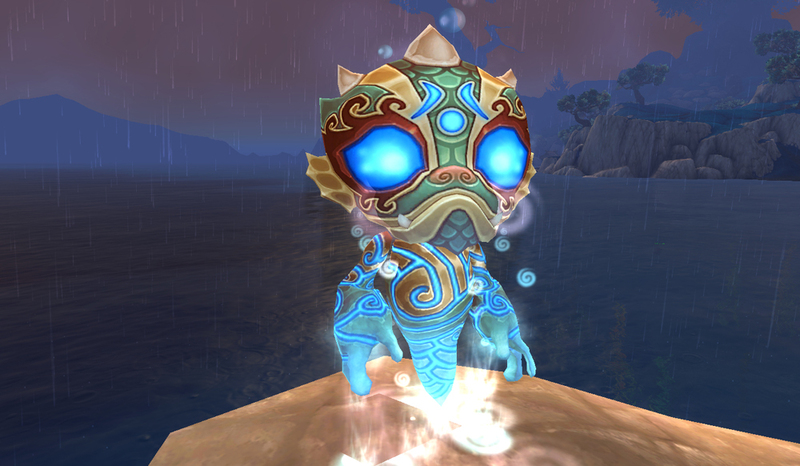 The third battle pet Glowy has 1 flying DoT ability, a combo DoT and reflexive damage ability and the critter ability Swarm, which increases damage taken by 100%. If it can hit. Luckily, it’s a series of small hits, so any pet with Shell Shield or the like will be able to avoid it. Like oh, I don’t know, maybe a snail. After the Fire Spirit is dead, cast your shield immediately and keep it up. You pretty much just win eventually, because Glowy can’t hit you. It does take a while though. 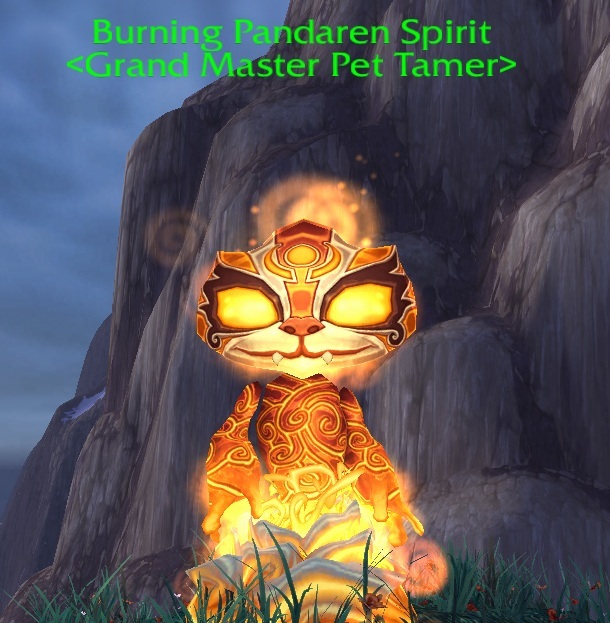 And then maybe one day, you’ll get a mini Burning Pandaren Spirit Tamer of your own. ——7/10/2013: added a walkthrough video! This entry was posted in strategy, tamers and tagged auctionable, daily, powerlevel, RNG, spirit tamer, strategy on March 22, 2013 by Liopleurodon.